The most comprehensive exhibition to date of work by British artist Oliver Beer is to go on display in Birmingham. The free art exhibition will be at Ikon Gallery in Birmingham from March 15 to June 4. Oliver Beer has become renowned for having a preoccupation with both the physical properties and emotional value of objects and focusses on emptiness and absence. Known for his use of film and sculpture, along with a strong emphasis on sound, the exhibition will features a new video piece commissioned by Ikon comprised of drawings by 2,500 local school and pre-school children. These children have been involved with Reanimation (I Wanna Be Like You), (2017) - a "re-animation" of a scene from Walt Disney's Jungle Book. For the piece, 2,500 Birmingham children, aged from early years until the age of 13, were asked to draw a single film still. Played in order of the children's ages, the resulting animation thus becomes increasingly "grown up" as, frame by frame, the scribbles of infants progressively give way to the increasingly lucid drawings of children and then adolescents. Another piece of Beer's work is Oma's Kitchen Floor, from 2008, which is the result of accumulated traces of human movement on a wall-mounted linoleum surface. 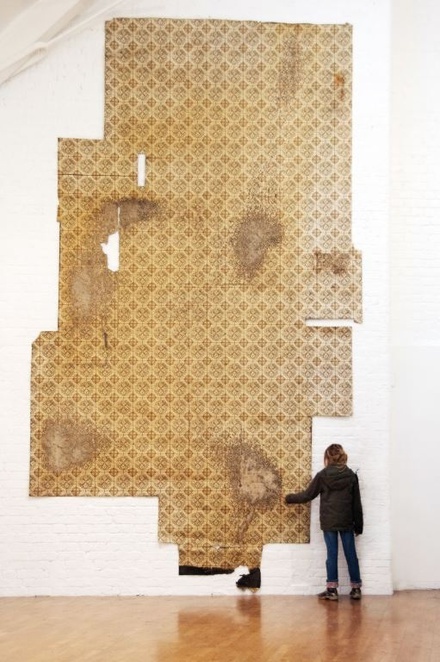 The exhibition includes Oliver Beer's Omas Kitchen Floor (2008) Linoleum, 511 x 350 cm. Beer said: "Oma was the name I called my grandmother. She put the lino down in the 1960s and over four decades her feet gradually wore through the decorative pattern. Over the years marks appeared in front of the oven, the sink, the front door, where she turned around in front of the fridge, where she sat at her table shuffling her feet. Like a drawing made over forty years, these worn patches describe half a lifetime of movement." In the same vein, the art piece Beer's Highway (2014) has lengths of an old train rail from Lyon's SNCF station. They have been polished to reveal the patinated traces of countless journeys - the movement of steel wheels on steel that have taken the weight of passengers on their way. This readymade, ready-used, sculpture stands as a memorial to lives that have sped by. Other exhibits include video pieces that feature songs and voice. Mum's Continuous Note (2013) is a touching portrait of the artist's mother as well as a subtle celebration of the beauty of sound. In the piece, she seems to be singing a continuous note without catching her breath for three minutes while explaining, through subtitles, a method of circular breathing, and the emotive potential of the harmonies she creates with the aid of a miniature blue guitar. 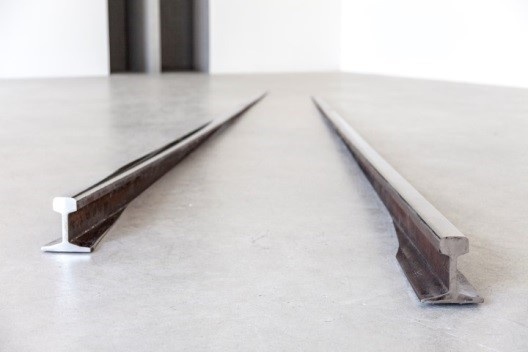 Oliver Beer Highway (2014) Polished train rails, two parts, each: 600 x 15.3 x 15 cm. Since graduating from the Ruskin School of Art in 2009, British artist Beer has gone on to attract acclaim and awards. He exhibited at the Centre Pompidou and Palais de Tokyo, in Paris, several times. Other successes include an exhibition in America at MoMA PS1 and the Watermill Center in New York. Beer was awarded the Daiwa Art Prize in 2015, which led to two solo shows in Tokyo. While his site-specific composition Call to Sound for Kilic Ali Pasa Hamam – a historic Turkish bathhouse – was acclaimed as a highlight of the Istanbul Biennial in 2016. A number of his recent works have involved a selection of vessels to create idiosyncratic musical instruments as installations. The empty space within each vessel has its own musical note at which it resonates, and so contributes to a symphony of natural frequencies, with microphones feeding back into looping sound systems. This idea is explored further in Making Tristan (2016), which features in the exhibition and consists of pots, vases and other readymade vessels singing out of their emptiness to achieve the "Tristan Chord" – the ground breaking chord from Wagner's Tristan and Isolde, marking the shift from tonal harmony to modernist atonality. 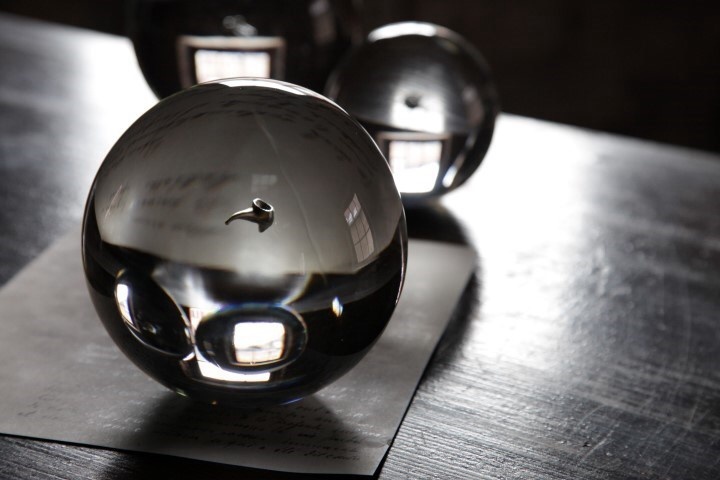 Sharing the same space as Making Tristan will be the three glass spheres of Silence is Golden, each containing an actual-size gold replica of one of the ossicles of the middle ear, either the hammer, the stirrup or the anvil. An Ikon spokeswoman said: "These little bones, are seductively visual – gold attracts our attention like no other material – whilst being embedded in cold, crystal silence." "Throughout the exhibition, embedded in the gallery walls, are Beer's 'dissected' objects –halved long-ways, lying flush, they become drawings of themselves. A lightbulb, a camera, a long stemmed smoking pipe – each lacks a third dimension, and so is empty, with any pictorial space that they might have occupied being absolutely compressed."